Enjoy your favorite plant-based fried foods without the added fat! If you love fried foods, but don't want the oil, added fat, and mess of frying, then you will want this cookbook. It shows you how to ""air-fry"" your favorite fried foods with little or no cooking oil. JL Fields, author of Vegan Pressure Cooking , has done the research, development, and testing, so you can serve crispy French fries, egg rolls, and all kinds of fried food in minutes - without frying. This amazing air-fryer appliance cookbook brings crunchy onion rings, vegetable tempura, and more to your table without making a mess or heating up your kitchen. Now you can eat delicious ""fried"" food while staying healthy. 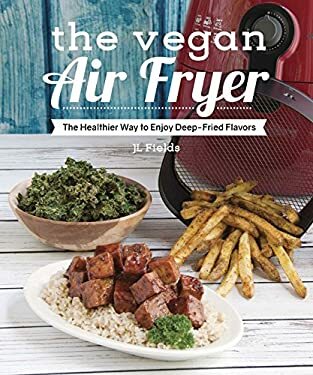 Recipes include: Jalapeo Poppers Vegetable Dumplings Potato Chips Eggrolls Mac 'n'Cheese Bites Buffalo Cauliflower Corndogs Fried Chick'n Fajitas Grilled Cheese SandwichesAir fryers, popular in Europe for years, have taken the U.S. by storm, and this is the first air-frying cookbook for plant-based diets. Vegan Air Fryer includes more than 80 recipes that are fun to make and bursting with deep-fried flavor. It will empower home cooks at any skill level to make delicious, healthy vegan recipes the whole family will love.